Most people associate PTSD with war and military combat, but any overwhelming life experience can trigger PTSD, especially if the event feels unpredictable and uncontrollable. Post-traumatic stress disorder (PTSD) can affect those who personally experience the catastrophe, those who witness it, and those who pick up the pieces afterwards, including emergency workers and police officers. It can even occur in the friends or family members of those who went through the actual trauma. PTSD develops differently from person to person. While the symptoms of PTSD most commonly develop in the hours or days following the traumatic event, it can sometimes take weeks, months, or even years before they appear. A person’s reaction to a traumatic event depends in part on the nature of the event itself and some of its main features. This is a piece of what shapes the internal aftermath, here are some of the key variables. Proximity – PTSD is more likely for those at the epicentre of a traumatic event than for those in its surrounding or adjacent areas, although a lesser percentage of people on the periphery will still be deeply affected. Duration – The longer the duration of exposure to the trauma, or the greater number of exposures within a certain period of time – in other words the ‘dose’ experienced. Extent of Brutality – Atrocities and interpersonal violence have a more devastating effect on the human spirit. When people are subjected to malevolence and brutality at the hands of their fellow human beings, the ravaging symptoms of PTSD go wider and deeper. Betrayal - This generates more severe symptoms, given its intimate connection with beliefs about safety, self-worth, and trustworthiness of others. Sexual abuse by a trusted family member or friend or authority figure creates immeasurable PTSD in those affected. Also children who have witnessed the murder of a parent suffer huge PTSD trauma. Threat of Dying – Life-threatening situations are more likely to increase the likelihood of subsequent post-traumatic stress. But even more than an actual threat is the perceived threat. Societal Context – The meaning and significance assigned to a traumatic event by the larger culture makes a difference in its impact. For example the veterans of the Vietnam war who returned to communities who shunned them or more recently the Catholic Church who turned its back on the survivors of child abuse. Unpredictability – Behavioural psychology has demonstrated that a distressing even that can be counted on the come and go with regularity is far less psychologically destructive than one that follows no rules. 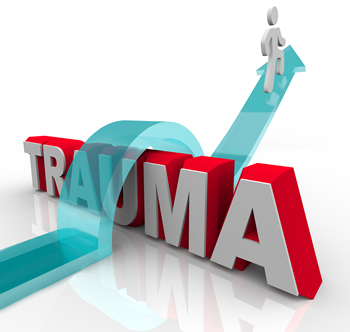 Injury – Not surprisingly should a traumatic event produce a significant injury or mutilation, the survivor’s vulnerability to PTSD is higher. Loss – When a traumatic event results in the loss of a family member or close friend, symptoms are exacerbated and risk of PTSD is higher. Loss of one’s home or / and important possessions will also increase vulnerability. Being Trapped – Post-traumatic stress by definition involves feelings of helplessness and powerlessness. When someone is literally physically trapped in a dangerous or terrifying situation, the survivor’s likelihood for experiencing PTSD escalates. Extracts from POST-TRAUMATIC STRESS DISORDER, author Belleruth Naparstek.